Think a satisfying, healthy, and flavorful meal takes too much time? 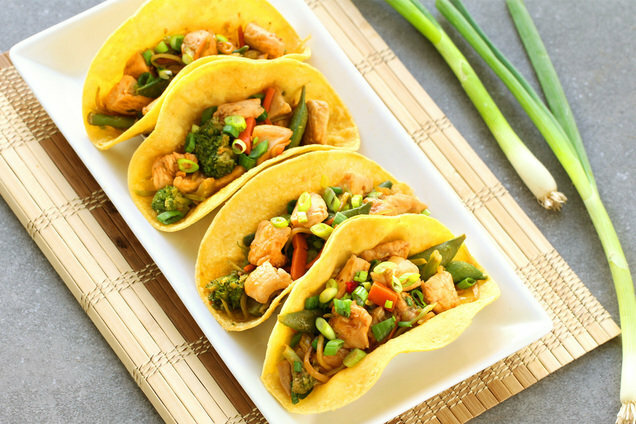 This recipe for Chicken Stir-Fry Tacos is here to prove you WRONG. Ready in just 20 minutes, and crammed with fun & flavor! Bring a skillet sprayed with nonstick spray to medium-high heat. Add frozen veggies and broccoli slaw. Cover and cook until frozen veggies have thawed, about 3 minutes. Add chicken, garlic, and seasonings. Cook and stir until slaw has softened and chicken is fully cooked, about 5 minutes. Remove from heat, add teriyaki, and stir to coat. Place tortillas between damp paper towels, and microwave for 15 seconds, until soft. Top tortillas with chicken mixture. Happy Flag Day in the USA -- that's today, June 14th! Slice up some Red, White & Blue Cheesecake in celebration. Help your buddies build up a solid collection of easy recipes! Click "Send to a Friend" now.